The rumored Gears of War Kinect game might not be a shooter. A Gears of War Kinect game has been rumored since late 2010, with most people assuming if the game existed, it'd be a shooter. Maybe not, says a new rumor coming out of Official Xbox Magazine. OXM writes in its "Crystal Ball" rumor section that Gears of War: Kinect could be a sports game. The magazine says: "What's the Gears of War Kinect game, you ask? The Ball suggests it could be a fatality-laden, COG-versus-Locust Thrashball spin-off in the vein of Mutant League Football." Recently, a different rumor said that Gears of War: Kinect was an on-rails shooter. I don't know who to believe, but the new rumor certainly comes out of nowhere. For the record, Epic designer Cliff Bleszinski has confirmed that Gears of War 3 will not feature Kinect functionality. Destructoid points out that OXM has printed many different rumors about Gears of War: Kinect, so this one may be pretty weak. Still, it's fun to think about. I'd definitely want to play a sports game where you chainsaw the other team's members instead of tackling them. 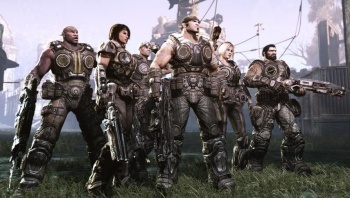 However, in the world of Gears of War, would anyone really take a break from war to play a game?